Miya Life 40 LEDs battery operated string lights are perfect for use to any decorative project. Newly design battery box (No more screws!!!) with locking clips is waterproof and very easy to hide perfect for decoration indoor and outdoor. 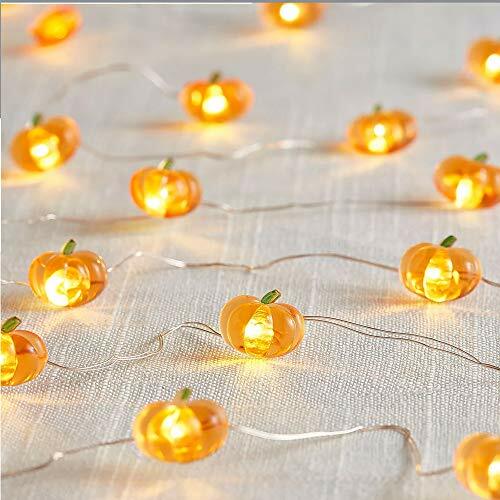 LED Orange Pumpkin Fairy String Lights create a fall and Harvestl lighting experience for your home, party or thanksgiving fall harvest day. The LED pumpkin String Lights are made with a fine bendable copper wire that can conform to any shape to add a beautiful decorative accent. Flexible yet durable, the string lights are perfect for positioning lights to any decorative project. Colored LEDs are individually mounted along the string and provide an elegant sparkling glow that can be seen from any angle. 1.For indoor/outdoor use, easily set or wrap, safe and never go hot. 2.Battery-operated, requires 3 AA batteries (not included), remote capable(remote included). 3. 2/4/6/8 Hrs timer used with remote control, build-in 6 Hrs timer provides automatic shut off. will turn off at 9 PM and turn it on again 3 PM the next day). 4.You can chose flicker mode and control the intensity of light, rang of remote control is around 5 meters. Height of each icon: 0.70inches. Icon are spaced every ：2 .3inches. If you have any questions about this product by MIYA LIFE, contact us by completing and submitting the form below. If you are looking for a specif part number, please include it with your message.